A particle accelerator is a big machine used by physicists to smash an atom into pieces to learn what it contains inside. Physicists are scientists who have specialized knowledge in the interaction between matter and energy. Physicists accelerate little subatomic particles almost to the speed of light, which is more than 186,000 miles per second. Since the invention of the particle accelerator in the 1930’s, scientists have found that the internal structure of the atom is more complex than they imagined. 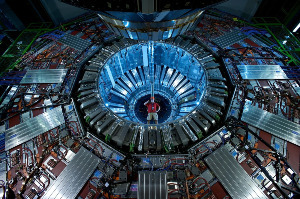 There are currently an estimated 30,000 particle accelerators in the world using different technologies. Some use electric fields to speed up the particles as they travel through a vacuum in a metal pipe. After a collision takes place, sophisticated particle detectors are used to detect and record the radiation and particles produced. Physicists then examine the results gathered to get a better understanding of particle physics. Of all particle accelerators, there are three main types: cyclotron, synchrotron, and linac. Cyclotron particle accelerators speed up particles in a spiral pattern that starts at the center. Synchrotron particle accelerators are descendants of cyclotrons and are the highest energy particle accelerators in the world. Lastly, linac particle accelerators are usually used for experiments or applications that require a steady and intensive beam of particles. A well-known synchrotron called the Large Hadron Collider (LHC) is made of about 17 miles of tunnel located 600 feet below the ground at the border of France and Switzerland. It is run by the organization CERN. CERN stands for “Conseil Européen pour la Recherche Nucléaire” which translates to “European Organization of Nuclear Research.” Synchrotron particle accelerators usually feature a completely closed pathway in which particles go around a ring, a triangle, or a hexagon. In the LHC, particles go around about 14 million times in 20 minutes to reach the energy level intended. Because of the heat produced, the LHC has the world’s largest cryogenic system which cools down to temperatures reaching -456 degrees Fahrenheit. Particle accelerators aren’t being used only for scientific research, they’re also being used for the development of new products and technologies, national security, and medical research. The source of the particles the LHC uses is a single bottle of hydrogen gas that’s changed twice every year.